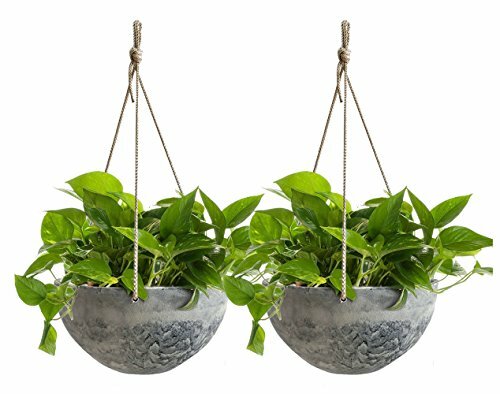 Hanging Planters for Outdoor & Indoor Use. ★【Unique Marble Pattern】The modern concrete look hanging planters with marble pattern, unique texture and distinguished features, are widely used in patio, balcony, garden, home, indoor and outdoor planting. ★【Adjustable Hanger & Drain】You can feel free to adjust the height to your liking with our sturdy heavy-duty triple rope hanger. The built-in drain automatically keeps your plants healthy and watered. ★【Light Weight & Unbreakable】Modeling by environmental natural resin, each hanging pot enjoys merely 0.52Kg light weight. Passing 36 Inch vertical height drop test indicates the planters superior strength. ★【UV Resistant & Durable】These planters are UV protected and enjoying long service life, as well as feature anti-frost, fade-proof, rust-preventive, stackable and recyclable characteristics. ★【100 Satisfaction】We provide full refunds & returns if there's any problem after receiving the product.